Andretti's father had maintained contact with his brother-in-law who had lived in the United States for many years. It took the family three years to obtain a visa for America. Alvise Andretti told the family they would move to America for five years and then return to Italy. Mario has explained: "When I looked at my life in many ways out of so many negatives here comes a positive and this was certainly one of them, here was an opportunity created for us, the kids, and my dad always cited that. He would say in a sense I am looking at your future, where I think would be the best solution for you kids to have opportunities and he was correct, he was right because if we had remained in Italy I don’t know whether I could pursued what my first passion was and the only passion I really had career wise." In 1955 the Andretti family emigrated to the United States of America, settling in Nazareth in Pennsylvania's Lehigh Valley with just $125 to their name. In 1959, after finishing high school, he planned to became a welder, but he falsified a driving license so he could pass for 21 and enter an amateur race. Mario and Aldo were surprised to find a half-mile dirt racing track when they moved to Nazareth. The twins worked on a 1948 Hudson Hornet Sportsman funded by money that they earned in their uncle's garage in 1959. They took turns racing the old Hudson on oval dirt tracks near Nazareth in 1959. They did not tell their parents that they were racing. The twins each had two wins after their first four races. Aldo was seriously hurt near the end of the season, and their parents were unhappy to find out that the twins were racing. Mario had 21 modified stockcar wins in 46 races in 1960 and 1961. Both of Mario Andretti's sons, Michael and Jeff, were auto racers. Michael followed in his father's footsteps by winning the IndyCar title, with Mario's nephew John Andretti joining the series in 1988. This meant that the Andrettis became the first family to have four relatives compete in the same series. With Mario sharing driving duties with sons Michael and Jeff at the 1991 Rolex 24 at Daytona, driving a Porsche 962, the Andretti clan finished 5th. Mario's grandson Marco completed his first full season in the Indy Racing League (IRL) in 2006, driving for his father Michael's Andretti Green Racing team. Marco finished second in the 2006 Indianapolis 500 and so became the first third-generation recipient of the race's Rookie of the Year Award. Andretti played himself on three episodes of the United States television show Home Improvement. and also appears in films such as the IMAX movie Super Speedway about the making of Newman/Haas Racing cars as well as being about Mario Andretti and Michael Andretti. He is a major character and sometime narrator of the 1972 film The Speed Merchants. Mario is also in the Pixar Animation Studios film Cars, where his voice is used for a cameo in which he plays the 1967 Ford Fairlane in which he won the Daytona 500, a parody of his own success in that race. Mario appeared in the off-road racing documentary Dust to Glory as the race grand marshal, where the movie documents the 2004 Baja 1000 race. Mario also wrote a racing column for the Indianapolis Star where he wrote about other drivers, equipment and cars. 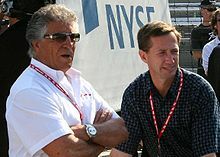 Mario Andretti was featured in the 2007 documentary A State of Vine, where he commented on his winemaking activities. He has a voice part in the movie Turbo. In November 2015, he guest starred on an episode of Jay Leno's Garage, driving Leno in multiple fast cars and talking about his past as a driver. In the first season's finale of TV series Scorpion, "Postcards from the Edge", the lead character Walter O'Brian is called Mario Andretti after crashing a Ferrari due to reckless driving. American country superstar Alan Jackson mentions Andretti in his song "Drive". These are the wins of Andretti Racing Enterprises, the team headed by legendary mechanic Clint Brawner. Andretti Racing Enterprises (the former Dean Van Lines team) was formed after Al Dean’s death in 1967 and was financed during the 1968 season by Firestone. ^ DAVE KALLMANN (June 18, 2005). "U.S. GRAND PRIX; Feel the need for Speed; Formula One racer tops". Milwaukee Journal Sentinel. Archived from the original on July 26, 2013. Retrieved June 12, 2007. ^ a b c "Biography". International Motorsports Hall of Fame. Archived from the original on May 8, 2006. Retrieved February 22, 2007. ^ a b c d e f g h i j k l m n Larry Schwartz. "Super Mario had speed to burn". ESPN. Retrieved June 14, 2007. ^ a b c "Andretti Races to Victory". New York Times. April 5, 1993. Retrieved September 26, 2007. ^ a b c "Mario Andretti: Living Legend (an interview)". C16 Magazine. May 22, 2007. Archived from the original on September 14, 2007. Retrieved June 14, 2007. ^ a b c d e f g h i j k l m n o p q r s t u v w x y z aa ab ac ad "National Sprint Car Hall of Fame Inductees". National Sprint Car Hall of Fame. Archived from the original on July 3, 2007. Retrieved July 10, 2007. ^ "Montona Napa Valley Estate Wines". Andretti Winery. Retrieved September 5, 2008. ^ a b Stenning, Paul (November 24, 2013). Success - By Those Who've Made It. Pg.25. In Flight Books. ISBN 978-1628475869. ^ a b Garu D'Amato (August 2, 2003). "Appreciating Andretti". Milwaukee Journal Sentinel. Archived from the original on July 26, 2013. Retrieved April 12, 2007. ^ "Mario Andretti – Began Racing In Italy". sports.jrank.org. Retrieved April 12, 2007. 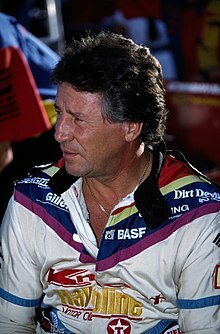 ^ a b c d "Texaco/Havoline CART History Mario Andretti". Texaco/Havoline. Archived from the original on December 22, 2006. Retrieved April 12, 2007. ^ "RRDC Evening with Mario Andretti". RRDC. Retrieved April 27, 2016. ^ a b "Biography". Motorsports Hall of Fame of America. Archived from the original on September 28, 2007. Retrieved February 22, 2007. 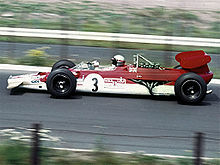 ^ a b c "Andretti's only Indy 500 win came in 1969". ESPN classic. Retrieved April 21, 2007. ^ a b c d Schwartz, Larry. "Mario Andretti synonymous with racing". ESPN. Retrieved February 22, 2007. ^ "Holman Moody owner's statistics". racing-reference.info. Retrieved July 12, 2007. ^ a b "NASCAR and IROC driving statistics". racing-reference.info. Retrieved March 10, 2007. ^ a b c Mattijs Diepraam, Rainer Nyberg. "THE CHAMPIONS / Mario Andretti". 8W. Retrieved June 14, 2007. ^ a b c d e f g Gerald Donaldson. "Mario Andretti". Formula One. Archived from the original on June 29, 2007. Retrieved July 16, 2007. ^ Tom Prankerd. "The Questor Grand Prix". forix.com. Retrieved April 15, 2007. ^ "United States Grand Prix history". Formula One. Archived from the original on September 30, 2007. Retrieved July 12, 2007. 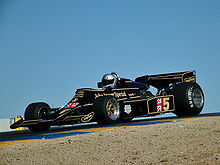 ^ a b c "Lotus – Ford 79". Retrieved July 13, 2007. ^ "STATS F1 • Mario ANDRETTI - Involvement". Statsf1.com. Retrieved November 20, 2011. ^ "The Andrettis". www.superspeedway.com. Archived from the original on February 25, 2007. Retrieved February 28, 2007. ^ a b Steve Crowe. "What curse? Andretti is back at Indy". Knight Ridder. Archived from the original on October 20, 2007. Retrieved July 11, 2007. ^ "'I didn't miss this': Andretti survives difficult weekend to get in field". CNN/Sports Illustrated. May 14, 2001. Archived from the original on June 8, 2004. Retrieved July 11, 2007. ^ "Le Mans 1966". GT40.org. Retrieved June 15, 2007. ^ Gregor Grant (1967). "Ford Again at Le Mans". Autosport. Archived from the original on September 28, 2007. Retrieved June 15, 2007. ^ "Le Mans 1967". GT40.org. Retrieved June 15, 2007. ^ a b "Legendary race car driver Mario Andretti received commendatore honor from the Republic of Italy". Champ Car World Series. October 24, 2006. Archived from the original on October 28, 2006. Retrieved July 11, 2007. ^ "Greg Anderson named 2004 SPEED Channel driver of the year". Red Line Synthetic Oil. January 25, 2005. Archived from the original on October 16, 2006. Retrieved July 11, 2007. ^ "''Arcipelago Adriatico'', Mario Andretti, il ''"nuovo Sindaco del Libero Comune di Montona in esilio'' (Mario Andretti, the new Mayor of the Free Commune of Motovun in Exile)". Arcipelagoadriatico.it. October 28, 2008. Archived from the original on September 29, 2011. Retrieved November 20, 2011. ^ "MARIO ANDRETTI RECEIVES SPIRIT OF COMPETITION AWARD AT SIMEONE AUTOMOTIVE MUSEUM DEDICATION". conceptcarz.com. Retrieved October 17, 2018. ^ "IMSA 1991: 24 h Daytona". ClassicCars. Retrieved January 31, 2009. ^ a b "Mario Andretti". Istria on the Internet. Archived from the original on March 11, 2007. Retrieved July 27, 2007. ^ "Dee Ann Andretti passes away". Racer Magazine. Retrieved July 8, 2018. ^ a b c "Mario Andretti". Internet Movie Database. Retrieved July 10, 2007.